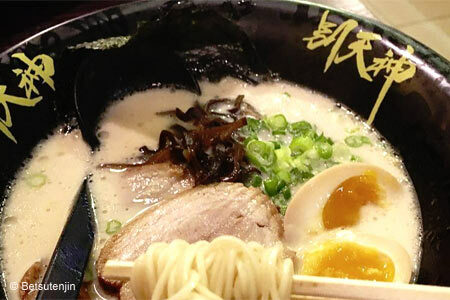 Barebones ramen shop serving the richest broth in town. About the restaurant: With just a handful of tables running parallel to the seating along the bar of the open kitchen, this ramen shop sets the tone for why people come: to eat and move along. While nobody’s actively rushed, the crowded space, bustling service and simple menu send the same message. Likes: Rich broth; al dente noodles. Dislikes: Rushed feeling; small menu. Food & Drinks: The menu lists just two ramen options (pork bone or prawn-miso) and two appetizers (gyoza and lobster salad). But nearly everyone goes for the combo special: pork bone ramen and four of the dumplings. The thick soup turns white from pressure-cooked bones, which combines with the richness to give the illusion that cream might be an ingredient. Fatty pork slices seem to float atop the bowl, resting lightly on the mound of gently chewy noodles --- which give another hint to slurp with speed, before they go soft under the soup. If the filling bowl isn’t enough, look for dessert specials like the matcha ice cream waffle. Above the bar, a line of bottles serves as the drinks menu, featuring a surprisingly large selection of domestics and Asian imports.